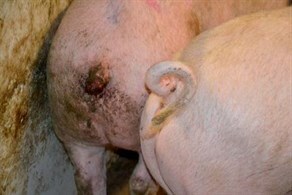 Tail docking is a common practice in most EU countries to reduce tail biting in pigs. Tail biting causes pigs pain and stress but, more importantly, it indicates underlying welfare problems. In a few European countries, such as in Finland, tail docking is forbidden by the national animal welfare act. Yet in Finland, pork production is a professional livelihood ranging from small to large piggeries where all pigs have tails. Animal welfare standards are slightly higher than average on a European scale and farmers take several welfare-improving measures to prevent tail biting. By addressing the problems in animals’ living conditions, health, nutrition and behaviour, tail docking is made unnecessary. Admittedly, occasional outbursts of tail-biting have to be tolerated and biters as well as bitten pigs will have to be treated accordingly to maintain the balance between individual and herd-level welfare. Lively little piggies are nosing each other and biting nylon ropes hanging from the ceiling. A bit calmer and fleshier growing pigs are rooting straw on the pen floor and tasting penmate’s tails and ears. A few pigs have bite marks on their tails, even one freshly bitten tail can be seen, but every pig has a tail of its own as a premise. 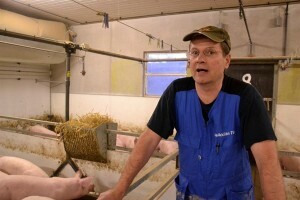 Timo Heikkilä, the owner of the piggery, has almost 30 years’ experience in pig production. At the moment his piggery feeds 20 employees, 3500 sows, 4000 fattening pigs and 1200 gilts. The piggery is one of the biggest in Finland and of reasonable size also in European scale. Tail biting occurs on Heikkilä’s farm, too, but most of the tails are intact. According to Heikkilä, tail biting used to be a problem on his farm, too. A few years ago there was a tricky situation where slaughterhouses could not take enough pigs in, leaving the pens overcrowded. After the pig rush eased, biting has been only occasional. Heikkilä stresses the importance of good feeding in improving pig welfare and reducing tail biting: there has to be enough feed of good quality available for all pigs. Also the conditions inside the piggery have to match the pig’s needs: feeding trough has to be long enough to serve every pig at the same time, and draught and temperature inside the pen have to be under control. It is also important to even out the litters right after birth, but after weaning penmates should not be mixed anymore. There is no bedding but the straw rack and a hanging toy provide enrichment for growing pigs (8–30 kg). Floor is mainly concrete and partially slatted. Ventilation seems to work fine as the pens are relatively clean. Good quality straw is the basis for effectively preventing tail biting, says Heikkilä. It’s not always easy to find large amounts of good straw to buy, so Heikkilä harvests his own straw through summer and fall. Using straw requires dry litter system or, as in Heikkilä’s piggery, a special slurry system designed to stand moderate amounts of straw. Ventilation and air quality are usually associated with the functioning of the slurry system and managing them all properly is especially important for keeping up animal welfare. Heikkilä uses straw as enrichment material, not as bedding. Every pen has a small rack full of straw for the pigs to pull out and chew. There is only a small handful of straw on each pen floor, but the pigs are eagerly nosing the two straws crossed and rushing around when extra straw is thrown to the pen. Prevention of tail biting through improved animal welfare is the most important measure, but when biting occurs, other measures are needed. Whenever there is a bitten tail, Heikkilä says he throws generous amounts of paper or straw into the pen, puts some tar on the bitten tail, and if possible, takes the bitten pig into a separate pen for recovery. In Finland pig health in general is exemplary and antibiotic use is restricted. On Heikkilä’s farm, illness protection is profound. After a trip to home country, foreign employees face 48 h quarantine before entering the piggery. Work clothes are changed after a thorough shower and a Finnish sauna. The color coding of clothes for different piggery units is as strict as it is in the animal hospital of the University of Helsinki. Health as a part of animal welfare and a way to prevent tail biting is not a joke in this piggery. If keeping pigs with tails in commercial, large-scale system works in Finland, why wouldn’t it work also in other European countries, Heikkilä suggests. He lists research, change of generations, shutdown of old-fashioned farms, and change in farmer and public attitudes as the most efficient ways of moving forward in animal welfare. All this requires also political goodwill and steering. The measures taken to improve pig welfare on Heikkilä’s farm don’t fundamentally differ from the basic Finnish standard, and there is a number of issues and options to further improve pig welfare. However, the reasonable scale and profitability of Heikkilä’s farm proves that these measures are feasible in modern pig industry. Heikkilä cherishes the idea that every civilized state can afford keeping pigs with tails, and that we shouldn’t push animals too far but be happy with less to keep our animals happy as well. Tail biting may not ever completely end, but at least there would be less suffering if few animals are bitten compared with the situation where all animals have to face mutilation. Wellbeing is the starting point. Avoid tail biting by prevention. – all pigs have to have access to food simultaneously. Take care of warm and draught-free resting area. Take care of proper ventilation and air quality. Give stimulation and rooting material preventatively, before problems arise. Take good care of animal health. “There’s always someone in charge of what is happening with the pigs – if it’s not me, it’s one of my employees”, says Timo Heikkilä. FareWellDock is a three-year research project which is part of the Animal Health and Welfare (ANIHWA) ERA-net initiative. The aim of the FareWellDock project is to supply necessary information for quantitative risk assessment and stimulate the development towards a non-docking policy in the EU. Read also the results of the Finnish research project on pig enrichment.